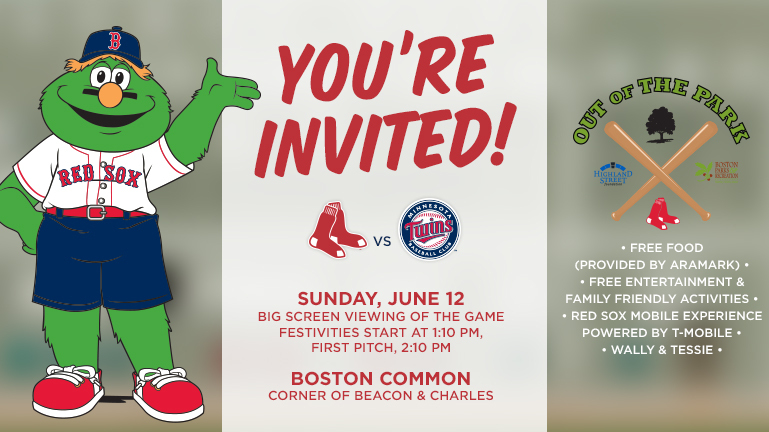 The Red Sox will again be hosting “Out of the Park” on Sunday, June 12 where they will have a jumbo screen in Boston Common to watch the Red Sox vs. Twins game. It is a free event with food provided by Aramark, entertainment and family friendly activities! You can also meet mascots Wally & Tessie. Fenway Park will host a “Dog Day at Fenway” event, presented by NutriSource Super Premium Pet Foods, on Monday, June 27, when fans are invited to bring their dogs to the ballpark for the evening. Fenway Park will be open to fans and their canines from 5:30 p.m. to 8:30 p.m. A “Dog Park” and pet-friendly businesses will be set up in the Big Concourse where water bowls and activities will be provided. Fans can also bring their pets out to the warning track for photos in front of the Green Monster. The World Series trophies will also be on hand in the seating bowl for photos. Tickets for Dog Day at Fenway are $10 for adults and are on sale now. Children 14 and under and dogs enter free of charge. Fans may enter through Gate B. Nutrisource encourages fans to post pictures of their Fenway Park Dog Day experience using hashtag #RedSoxPets to see their photos displayed on the centerfield video board during the event. Ferris Bueller’s Day Off, the 80’s classic comedy about a teen who feigns illness in order to skip school and spend a carefree day exploring Chicago with his friends, will be featured on the Mitsubishi Electric Diamond Vision® center field videoboard at Fenway Park, Wednesday evening, June 29. Movie Night at Fenway Park Presented by Mitsubishi Electric” is free for Red Sox Season Ticket Holders. Tickets will be distributed to members. General admission tickets for the public, priced at $10 for adults and $5 for children 12 and under, are on sale now.